Valentin Vassilievitch Silvestrov (b.Kiev, 1937) showed early originality but was refused permission by the Soviet authorities to attend Stockhausen's seminar in Darmstadt in 1961. Surprisingly, his Third Symphony "Eschatophony," was premièred there in 1968 under the direction of Bruno Maderna. Theodore Adorno rejected the objections of purists who deemed Silvestrov's work too expressive. Silvestrov's success irritated the powers in Moscow who branded him an Ukrainian avant-gardist. 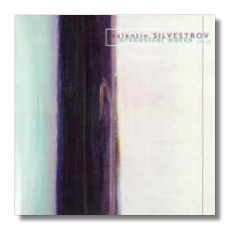 In the '70s Silvestrov's music became neo-romantic, 'impregnated with slow expressive confidence and greatly prolonged melodic lines'. The Fifth Symphony is one of a series of works of a beauty of which evokes the haunting adagios of Mahler. His musical language has been described as 'transforming every composition into an epilogue, a postlude to the form music history assumed at the end of the nineteenth century', a precursor of later "spectral" music, sharing with Scelsi the search to recover the cosmic force of sound. Melody is core to his style; 'waves of music travel towards the sea of silence'. It ebbs and flows, like waves breaking upon the shore, each surge with a halo of harmony and instrumental clothing, a unique effect corresponding to the subtle resonances and pedal effects of his piano music. The Fifth Symphony (subtitled Postsinfonia) is an extensive orchestral monologue, "after-music", "end-music", music from beyond, 'not the music of an intellectual who constantly seeks to correct himself'. Echoes of Mahler are inescapable, with 'recitatives for trombone, melodic patterns with declining profiles, arpeggio-accompaniment, prolonged descents toward silence'. Given patient receptivity, you may find yourself swept away into new emotional dimensions, a new and rare quality of beauty. Exegi Monumentum for baritone and orchestra sets a Pushkin poem about the problem of the life and survival of artistic work in the face of the indifference or hostility. The Megadisc notes writer quotes the closing stanza: "Whether or not people speak kindly of you, Do not expect laurels, Do not worry about prejudice, And do not argue against stupidity". I found these unique and moving works; it is regrettable that the poem was not printed in full, with translation, also that the small print is testing for imperfect eyesight. The recording is excellent and the performance has the stamp of authenticity.